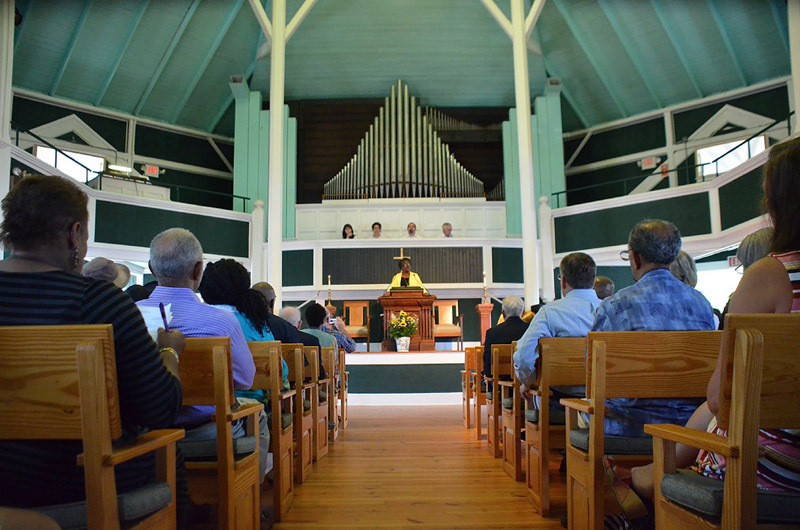 Union Chapel was filled to hear Reverend Clark of Emanuel African Methodist Episcopal Church. He waited until they bowed their heads in prayer, then started shooting. For six horrific minutes, on the evening of June 17, 2015, a hate-filled young man ranting a vile racial manifesto, shot and killed nine members of the Emanuel African Methodist Episcopal church in Charleston, S.C. Dylann Roof, 21, later confessed to the crime, according to investigators. In the minutes and hours and days that followed, members of the victims’ families, though mired in shock and grief, publicly forgave the killer. In the most horrendous moments of their lives, members of the church upheld a principle of their faith. Some of those following the tragic events were astonished. 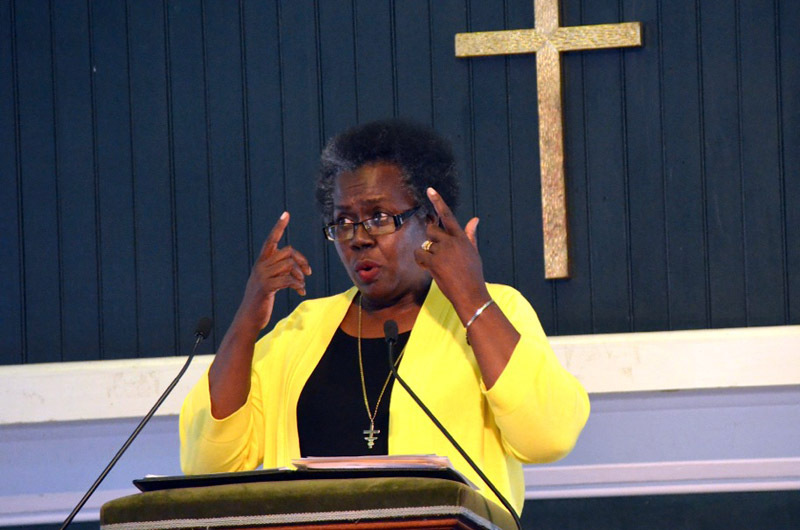 Reverend Clark was appointed permanent pastor of the historic church known as Mother Emanuel in January, and served until a few days before her visit to Martha’s Vineyard. Last week she was reassigned by church leaders to another South Carolina church. An accomplished scholar and community leader, she led Emanuel A.M.E. through some of its most difficult days. 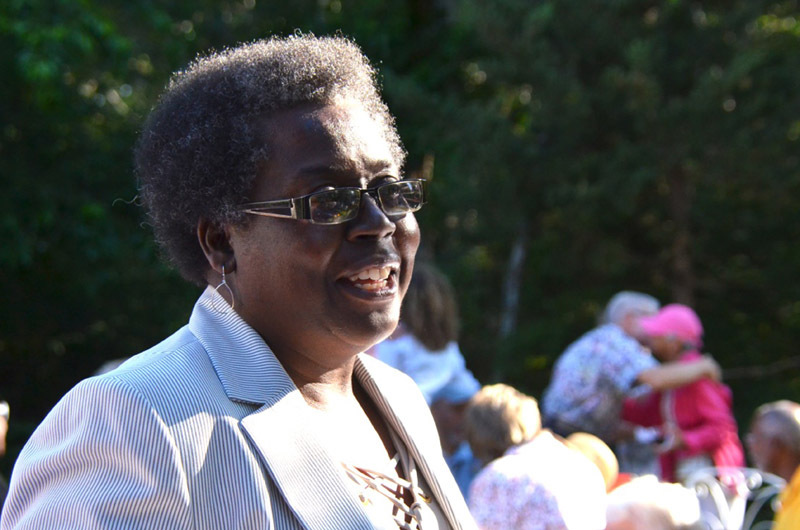 In an interview on Saturday, at a picnic hosted by members of the Union Chapel trustees and ministerial committee who invited her to the Vineyard, Reverend Clark said the Island reminded her a bit of her coastal South Carolina roots. Under the soft evening sun her voice shifted into the familiar cadence of a southern preacher. Not thunderous and commanding, but soft, assertive and confident. She paused a moment, and expounded further on the concept of forgiveness, even under, especially under, the most trying circumstances. Reverend Clark said she would rely on conversations with the people sharing her company at the picnic to give her bearing on a topic for her sermon the following morning. On Sunday, a sizable crowd filed into nondenominational Union Chapel and greeted her with warm applause as she stepped forward to the pulpit. She said she was flooded with emotion, and to no one’s surprise, said she would speak on the theme of forgiveness. With humor and gentility, she illustrated her beliefs with scripture and with plain talk. Though her voice was hardly amplified, everyone in the chapel heard her. With the historic echo of the Cottage City Camp Ground tent revivals evident, the audience joined in with laughter, and verbalized their response to the sermon. Reverend Clark ended her talk with a building intonation of inspiration and wisdom. Her emphasis was light on fire and brimstone, heavy on measured authority. “Let the past be the past, forgive your former things, because God wants you to do a new thing. Forgive your friends and let them be your friend again. Forgive your enemies for they may become your friends. But most of all, forgive yourself. Learn to forgive in order that you might be forgiven. Simply speaking, let it go.” The audience stood in a prolonged ovation.